While walking through the cedar woods at the back of the property last week, I came across this oddly-shapen poplar tree. Being so used to the idea that trees grow vertically, any trunk that crosses that pattern really stands out. What was particularly interesting to me about this tree was the curve in the middle. How would that have happened? It’s almost as though the trunk was made of plasticine and sagged once it was horizontal. You can’t really see it in this photo, too many trees in the way, but the branches at the top of the tree curve up from the trunk and are growing vertically, suggesting that the tree, despite the big split in its trunk, is still alive. So my first thought was that this happened when it was still shorter, and the stuff to the right of the big curve has grown since. But that doesn’t make sense, either, because the tip should have started growing straight up again at the point where it found itself horizontal, which would have been the low point on the curve in that case. Looking more closely at the trunk, it would appear that this isn’t the first time this poor tree got broken. There’s the fresh snap, still looking a little raw and coloured, at the far left. Then, just a short distance to the right of it, is a jagged bit of wood sticking out from the line of the trunk. It looks like some years ago the trunk snapped at that point, but not completely. Cause is hard to say, being an old injury. 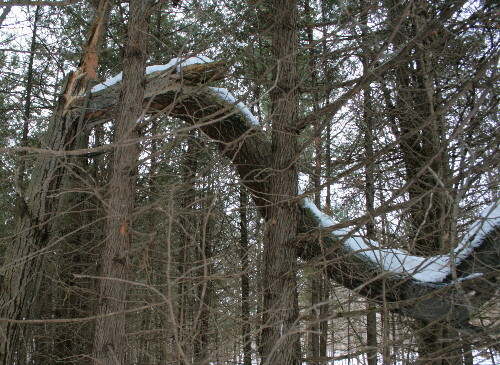 The top part of the tree toppled to the side, but was still affixed enough to keep growing. It did, at that point, turn to start growing straight up, and it probably lasted that way many years, given the thickness of the trunk and how much tree is grown from the point where the trunk makes a right-turn (see image below). This old break might have happened in two stages, a small tear first that caused the initial swooping shape, and the second, larger rip that resulted in an abrupt right-turn as the tip corrected for its new orientation. Perhaps, eventually, the top part of the tree, growing sideways from the trunk base, grew too heavy to continue to be supported, and the trunk broke a second time. Given the vertical growth of the branches at the top of the tree, this second break didn’t kill it, either. What amazing resilience. 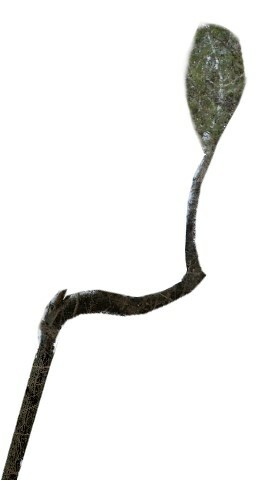 My crude reconstruction of the tree before the most recent break, but after the first (simply rotated the top half of the tree in Photoshop so it'd line up with the base of the trunk). That tree should get some kind of award, or a letter from the Queen. What an inspiration! Trees are pretty amazing, hardy organisms. I guess you have to be when you can’t just pick up and move.